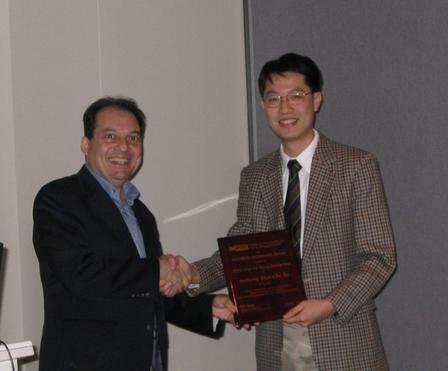 Nick Sahinidis (left) and Anthony Man-Cho So. which establishes novel connections between the behavior of sums of random matrices and the theoretical properties of various optimization problems. In this paper, the author achieves a multitude of objectives simultaneously: First, by using a deep mathematical tool of non-commutative Khintchine's inequality in functional analysis, he establishes a sharper upper bound on the norm of a sum of certain random matrices, thereby resolving a recent conjecture due to Nemirovski. Second, he shows that this sharper upper bound leads to an improved approximation guarantee for an SDP-based approximation algorithm of Nemirovski for quadratic optimization problems with orthogonality constraints. Third, he obtains improved safe tractable approximations of a certain class of chance constrained linear matrix inequalities. Finally, he extends a recent result on distributionally robust stochastic programming to a much larger class of probability distributions by relaxing a key assumption. With a clear exposition, the results of this paper have the potential to find further applications in optimization.